Posted on August 29, 2011	by Frank A. Posted on August 23, 2011	by Frank A. The WFIRC held its third club race meet of the year with 16 skaters taking part in a the one lap time-trial and four race program. This was the biggest race meet yet with almost every skater creating personal bests in at least one distance. 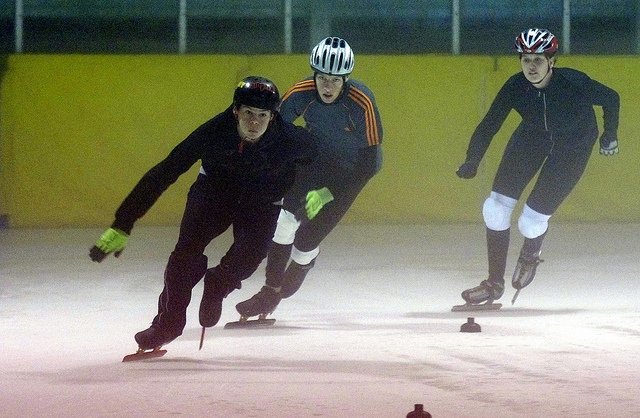 We had three more promising young skaters in Carys, Ben and Ryan competing in their first ever short track races with some good times for only having been on speed skates for just three weeks. Check the results page for all club racing results or click here>>>>> for this week’s results. We have skaters from Nippers (8-years-old) right up to Masters (over 30-years), so don’t let age put you off, be active and get on the ice – it is free to try, so email or call Frank (details in the contact tab) for details about your free trial. Entry has opened for the 2011 Australian Short Track Championships to be held at Docklands, Melbourne on the 7th and 8th of October. Posted on July 27, 2011	by Frank A. The past weekend saw WA short track history made with the first ever Western Australian short track team competing in the Duke Trophy National Teams event held at Canterbury Ice Arena in Sydney. 6 WA skaters competed in events ranging from 222m to 3000m across 4 divisions, with two of our skaters, Madison Poole (Midget Div.) and Mark Chong (Sub-junior Div.) going under the current national records in two distances. 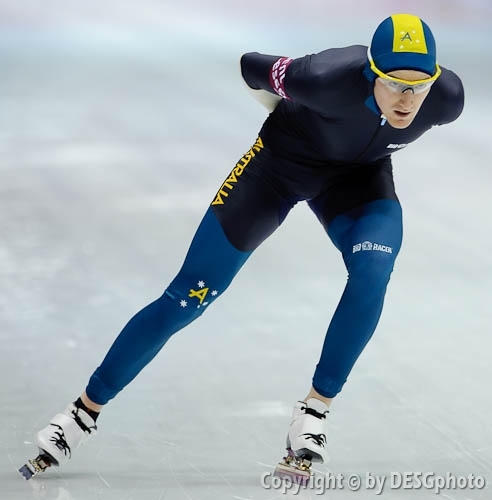 Unfortunately for Mark, he was second in both of those races and won’t be credited with a national record, but it is amazing effort after transitioning to ice speed skating in February this year from inline speed skating. All others skaters saw great improvements in their own personal racing skills, as well as establishing new personal best times, and I have no doubt that we will produce more record holders over the coming years. All skaters should be proud of their efforts, and the way the WA skaters presented themselves both on and off the ice won the WA Team the ‘Spirit of the Dukes’ Cup. All skaters had been inspired by a private video message delivered from 3 time Winter Olympian and WA skater Richard Nizielski before they left to compete in the event. Even though WA did not have any ambitions on winning the Duke Trophy competition this year, we were more than pleased with our results, coming fourth but with only a 1/4 of the size of the NSW and QLD teams and a reduced Victorian team, it was always a numbers game. We look forward to sending a bigger team next year and pulling in the gap between WA and the other states in a few very short years. 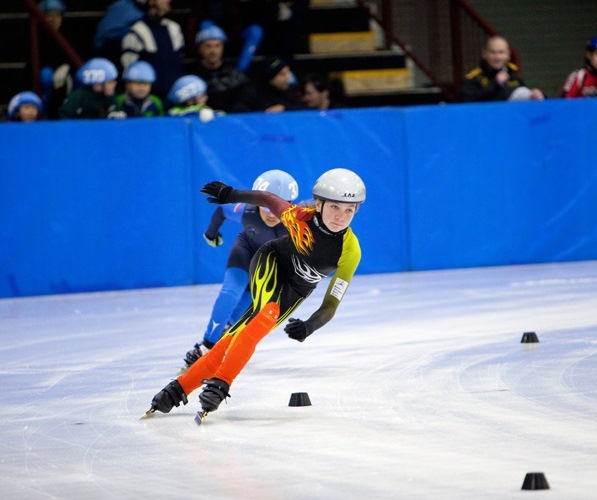 If you would like to be a part of the growing sport here in WA, make contact with us today and enjoy the fun, fitness and excitement that is short track ice speed skating! All ages over 8 years are welcome, including Master/Veteran age (an assessment of younger skaters can be made on an individual basis). Posted on July 15, 2011	by Frank A. The Western Flames Ice Racing Club members received their new suits this week and showed them off at training on Thursday morning. The girls showed just how striking the flame design looks while practicing their starts. Mark showed off his suit during some corner drills. 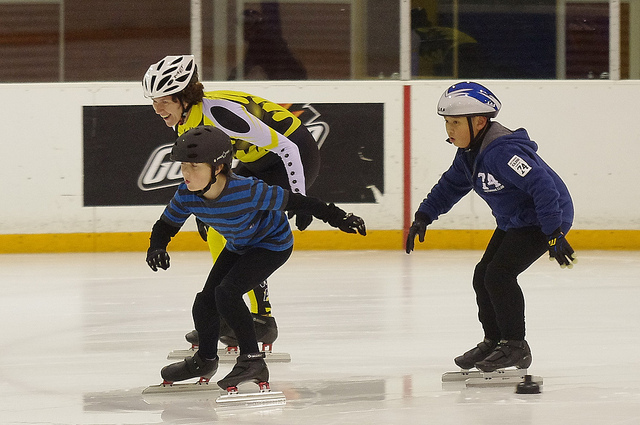 New skaters are always welcome – we have some skates for use and coaching is free. There will be club racing at the Xtreme Ice Arena in Mirrabooka this coming Sunday (17th) for all members. Our last race meet on the 29th of May was very successful and we are hoping all skaters will achieve personal bests this weekend. The session starts at 8:15am and racing will commence at 8:30am. All skaters need to be at the rink by 7:45 to put out the mats and warm-up. WA will be sending six skaters to the Duke Trophy competition to be held in Sydney next Saturday and Sunday. Good luck to all skaters racing this weekend and at the Duke Trophy next weekend – I’ll post the results as I receive them. Posted on June 24, 2011	by Frank A.
Sunday the 29th of May saw the WFIRC hold its first ever race meet. 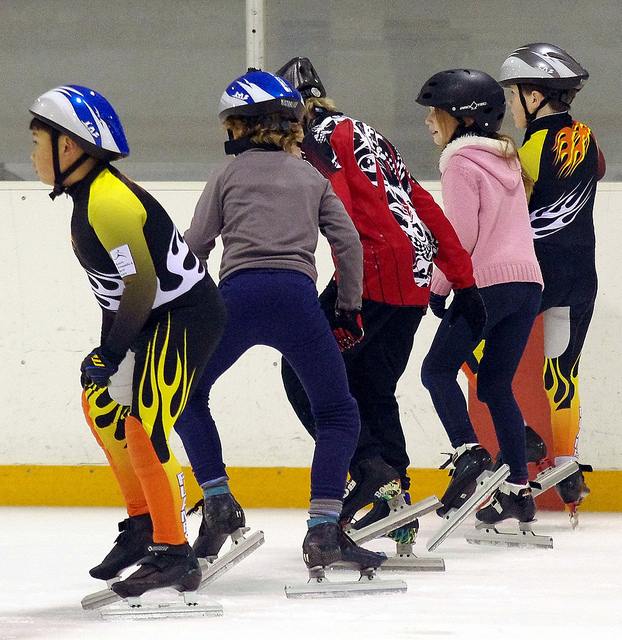 Ten skaters and the coach took part in a race program of a 1-lap time trial and three different distances. 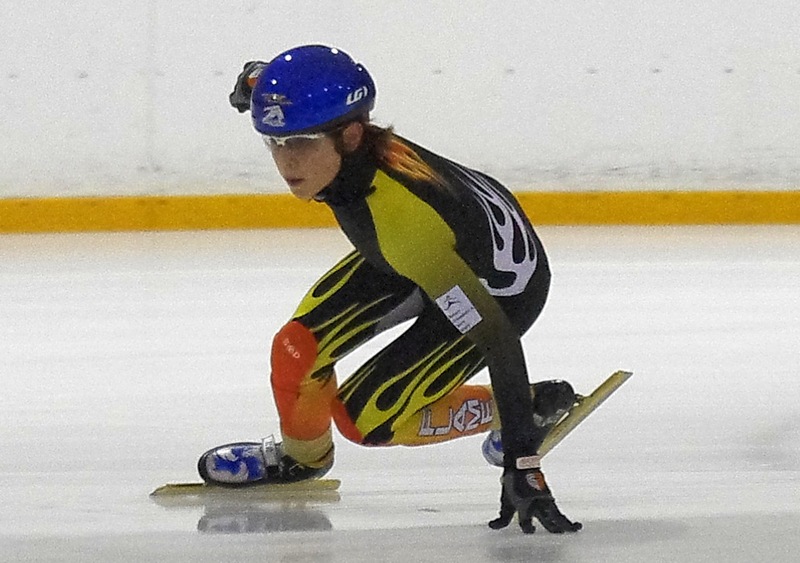 As a first time racing for most of the skaters, it was a chance for them to post their first ever times over various distances, and also to began learning about the the rules of short track speed skating. It was a very successful morning with some good first times being recorded. Some skaters learnt about the line dge of short track by testing out the new safety pads with unfortunate falls, but luckily with no major injuries. Many thanks to the parent and sibling timekeepers. WA skaters will compete in the Duke Trophy to be held in Sydney on the 23rd and 24th of July 2011. This will be the first time that WA has fielded its own team in the State Teams event named in honour of Australian speed skater Len Duke. 6 skaters will travel to Sydney to compete in the event in which skaters accumulate points for their respective teams, and not themselves. Without a full team (24 skaters) WA will not be able to win the event, but with some of our skaters it will be great to see us win some points in particular divisions. For all of our skaters (except Frank) this will be their first ever short track competition outside of club racing – a baptism of fire for the Western Flames IRC club members which I know they will enjoy. Last year, Frank Anderson skated for QLD and won the Len Duke Fairest and Best award for the competition. This year, Frank gets to skate for his home state for the first time in this event and can’t wait to represent his club and state. Good luck to all the skaters. We’ll post pics of the new WFIRC suits when we get them. Posted on May 26, 2011	by Frank A. Last Sunday saw members of the Western Flames mark out the new permanent track before training. This will save much time before each session where we were marking a rough track with a string line and chisel. It also provides us with an accurate 111.12m standard track to record times and compare with other skaters around the world. Hopefully we will get time over the coming weeks to mark multiple tracks during our training sessions. This Sunday (29th May) will see the Western Flames Ice Racing Club’s first time trial and racing morning since commencing in February. 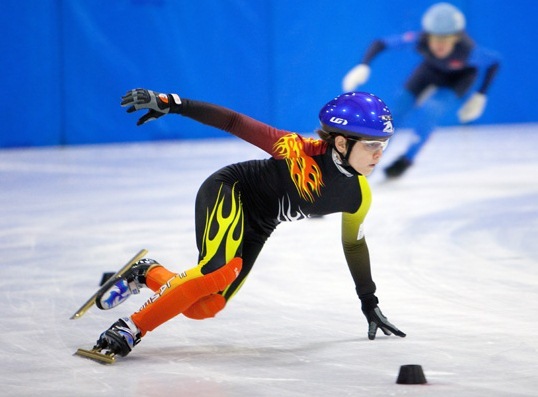 Each skater will compete in a grading 1 lap flying lap time trial before racing in structured race formats and compare them to times later in the year. The session will start 8:15am with racing starting at 8:30am after a warm-up. Help will be required for tasks such as timing and lap-counting. All members need to be there by 7:45am to help with setup and for the off-ice warm-up. There is free entry for any spectators who would like to come and watch the racing. See you all Sunday. WAISSA affiliated with Australian Ice Racing Inc.
Posted on May 21, 2011	by Frank A. Last week, Australian Ice Racing Inc. accepted the WAISSA application to become the affiliated body for Short Track Speed Skating in WA. At the moment, there is only one WA club, the Western Flames Ice Racing Club and both are working together to grow the sport here in WA. The WFIRC now has 15 members after only 12 weeks of being up and running. They are always looking for new skaters and next Sunday (the 29th of May) will see our first race/time trial morning for our skaters. The race morning will commence at 8:15am and conclude at 9:45am. 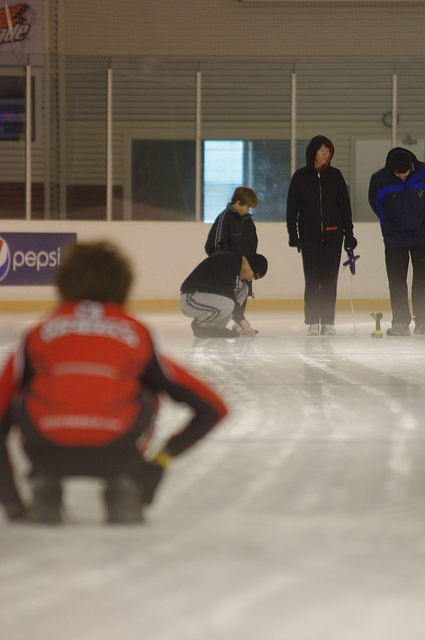 Tomorrow sees us finally laying a permanent track at Xtreme Ice Arena prior to our training session, which will save us time in measuring a rough track prior to each session. We will be arranging new club suits in the coming weeks, and hopefully we can have some trial suits before too long. If you wish to try the sport, make contact with Frank through the contact tab above. Posted on May 1, 2011	by Frank A. Last week saw the Western Flames Ice Racing Club take delivery of 20 new crash mats to improve the safety of our skaters. At a cost of over $8000, it is not investment to be taken lightly but the safety of our skaters will be well worth the expense. We have also had three new members in Thomas, Laurent and Emma in the last couple of weeks which brings our total to 12 members in less than 12 weeks. We have also had new skaters in Celeste and Madison and hopefully we’ll be weloming them into the WFIRC real soon. Mark Chong is off to Sydney this week to participate in the Elite Development Program under the watchful eye of National Senior ST Coach Ann Zhang. Mark will benefit greatly from a very intense four day program. We wish him the best for the camp and we look forward to his return. We will be programming some racing and time trials in the next few weeks, and I know that the whole crew are really enjoying it, so we’ll be formalising it shortly. 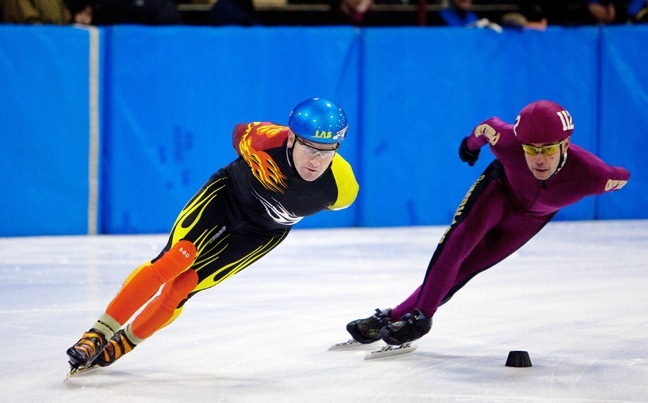 Remember, if you want to try short track speed skating, your first session is free to try, so what do you have to lose? Send me an email if you want more information. Posted on April 9, 2011	by Frank A. 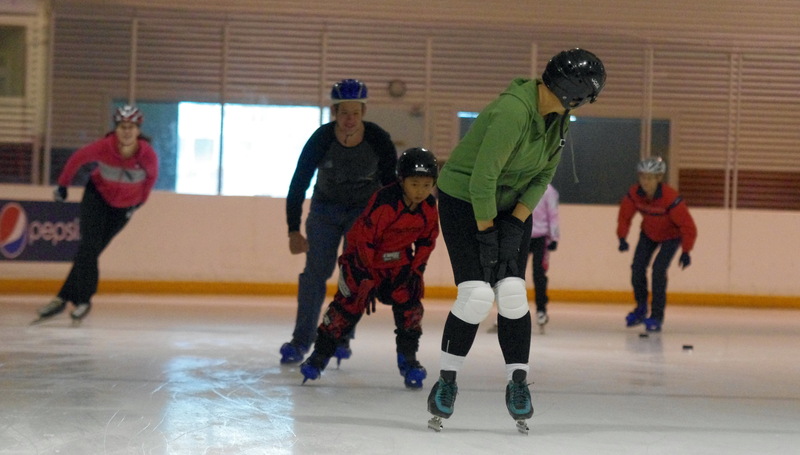 The last few weeks have seen many new skaters come down to Mirrabooka and try speed skating. Last week saw 13 skaters on the ice for training. The Western Flames new protective corner padding should be completed and ready for use next Sunday (17th April) so we can start skating a bit harder with improved safety. We will have some skaters in their brand new Bont skates for next Sunday as well, so we’ll start to work on bringing those times down. The Chong family returned from their two week trip to Sydney where Mark trained under former Australian Olympic coach Maggie Holland, also impressing current National Coach Ann Zhang at one of the training sessions. Hopefully in the next month we can get to mark our permanent track on the ice, and the planning has also started for some time trials over the next 6-weeks. The WAISSA is still waiting for an official response from the AIR in regards to affiliation, but hopefully this will be accepted very shortly. So, if you want to come and give the sport a try, send an email via the ‘contact’ button or call on the number listed. Training is 8:45am on Sundays for beginner skaters. The first session is free, then $15 a session thereafter.